Mounted police horses get the once-over for this year’s National Equine Health Survey. London’s police horses are among those who will be counted in this year’s National Equine Health Survey (NEHS), which uncovers health trends and issues in horses. 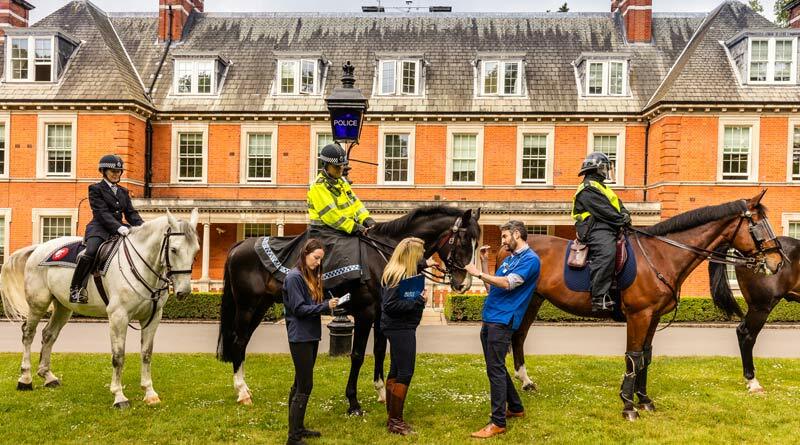 The equine team at the Metropolitan Police Mounted Branch based in Hyde Park had their teeth, hooves and eyes checked, and their vital statistics recorded for the survey this week, from May 22 to 29. Results of the survey help build a picture of the health and disease in the UK and define priorities for future research, training and education. Over the past six years the survey run by Blue Cross, in partnership with the British Equine Veterinary Association, has developed to become one of the UK’s most important endemic disease monitoring initiatives. The results are referenced in leading veterinary and equestrian publications and papers and are regarded as valuable benchmarks for our general knowledge of horse health. From checking teeth, hooves and eyes, to clambering up stepladders to take the vital statistics of the majestic horses, pet charity Blue Cross joined forces with the Police Mounted Branch to encourage horse owners to take part in the charity’s National Equine Health Survey this week. Blue Cross Education Officer Gemma Taylor said the charity oped that the police horse participation in the survey would encourage others to follow suit and be ambassadors for horse welfare.